Even though design and appearance may not be critical in the choice for a product, the first impression of a product is often of big importance and you simply can’t ignore this when looking at the DimLux Expert Series! The streamlined and stylish golden housing and the shining reflector are an indication of the professional quality and they set the bar high for this product’s performances. It will not surprise you that the performances are excellent and that they belong to the best of the market. 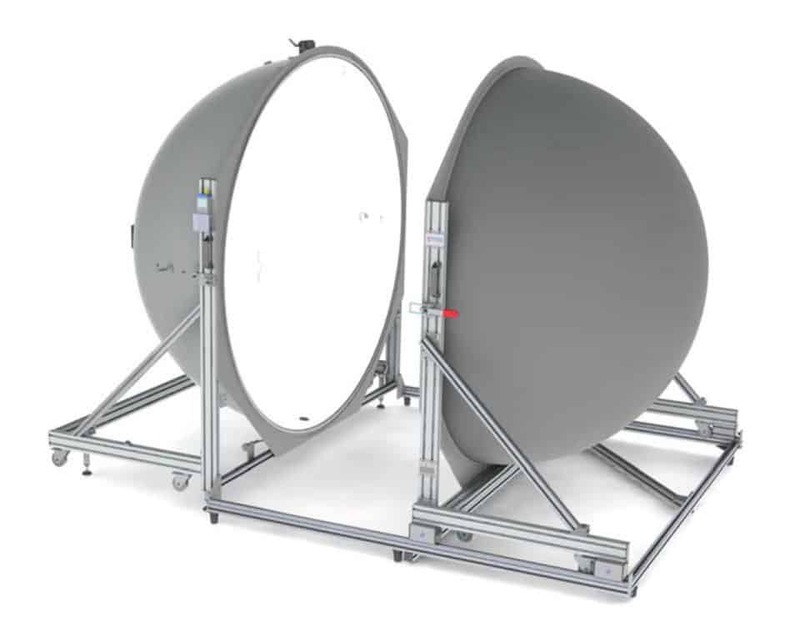 There is a 50mm connection on the reflector with which warm air can be extracted to significantly lower the room temperature. Moreover, individually available attachable reflectors (ADD-ON) can be placed to reduce the wall losses even more. Usable with 250-750W lamps. The reflector is replaceable. To increase and enhance the total reflectivity of Miro Silver, the material used in DimLux Alpha Optics Reflectors, several nanometer-thin optical coatings must be applied to the aluminum surface in a vacuum. Miro Silver is on another level than the normal anodized aluminum lighting grades, also known as “hammer tone” or dimpled aluminum, that you’ll find on the competition. 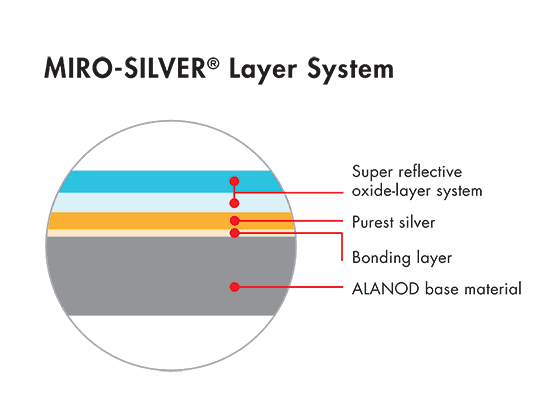 They only have a total reflectivity of up to 87%, while Miro Silver is 98% reflective. 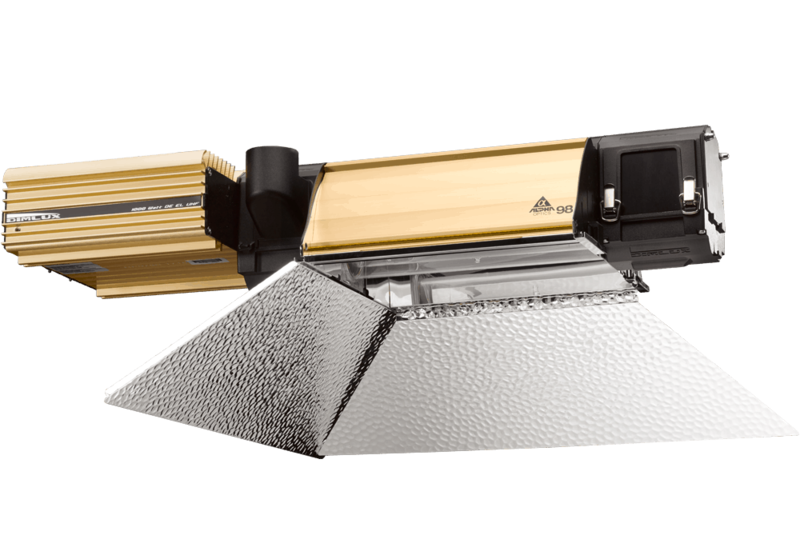 What stands out in the DimLux Expert Light systems besides the attractive appearance, is that the three major components (reflector, ballast, and lamp) are all covered in one robust unit. This reduces the risk on electromagnetic interference (EMI) and ensures that an uninterrupted energy flow reaches the lamp. It also helps to create free space as the ballast no longer has to be attached to the wall or on the floor, and as no cables are needed between the ballast and the reflectors anymore. The Alpha Optics 98 reflector is developed according to the Single Bounce Clear Sight (SBCS) principal and is equipped with Miro Silver mirrors. Thanks to this, the highest possible efficiency (98%) of all available horticulture reflectors is reached. For better overlap and in order to minimize wall losses, the reflector is equipped with adjustable side reflectors. Thanks to the open reflector design, the lamp is passively cooled, which stimulates the lamp’s lifespan and efficiency. The DimLux Expert Series has the highest PAR light output and system efficiency of all available horticulture lamps. Check our lab reports and independent lab reports for reference. The unparalleled performance is made possible because every component inside the fixtures are from the best quality and designed to match each other in order to get the best possible results and performance. 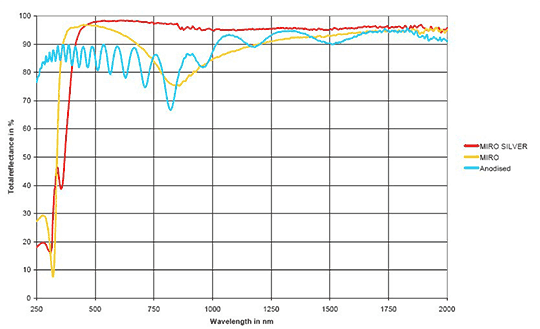 The Alpha Optics 98 reflector and DimLux Extreme Series are developed in our own laboratory. Thanks to this, our technology. is unique and we achieve better results because of our thoroughly tested optimized reflector and lighting technique. Our is optimized in an integrating sphere. Light rays incident on any point on the inner surface are, by multiple scattering reflections, distributed equally to all other points. The effects of the original direction of light are minimized. Dimlux Alpha Optics reflectors are used in all Dimlux fixtures. The combination of Single Bounce Clear Sight (SBCS) and specular Miro Silver reflectors give an unparalleled quantity of grow light and because of the optimized heat management the highest possible efficiency of any commercially available grow light. The Single Bounce Clear Sight design prevents that light (or heat) bounces back into the reflector or lightbulb. Multiple reflections inside the reflector heat up the reflector because light is converted to heat. The result is less light and more heat. Precision optics made possible because of the low diffuse reflectance. The only surface that applies to the SBCS principle for the highest possible total reflector efficiency. Hammered reflectors always have multiple reflections, the smaller and more compact the reflector the more multiple reflections the more reflectance losses. 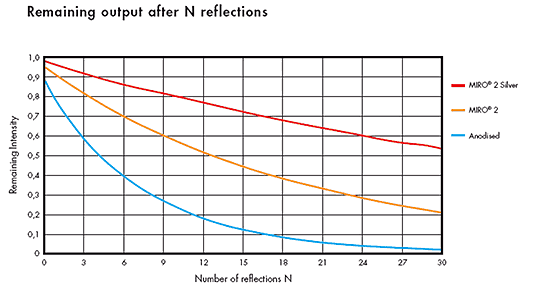 An average of at least 3 multiple reflections (equals 18% reflectance loss) is common for most compact horticultural reflectors. Specular reflectors show a dirty surface very quickly so action can be taken in an early stage to prevent the dirt from burning into the surface. With a hammered surface burned in dirt is very hard to see and cleaning will also be very difficult as not impossible because of the hammered texture. Dust is easy to remove but dirt that cannot be removed by a dry microfiber cloth. It’s very hard to remove because of the dimpled structure, cleaning the reflector by hand is a hard job, mechanical cleaning is the only way to clean a hammered textured reflector properly. Lower reflector temperature (indirect room temperature) caused by the superior IR reflectance. With Miro 95 more radiant IR heat will be converted into convection heat.